London Westbank Gallery presents: “Oblivion” a solo exhibition by street artist Dan K. Constantly challenging himself with both subject-matter and technique, and with a hatred to sticking to one thing for too long, Dan K’s work is bold, exciting, fresh and not easy to categorize. It's the unpredictability of Dan's work that excites London Westbank Gallery and his blend of graffiti and fine art styles which creates art that really works on canvas, inside the gallery. Here's what Dan K had to say about the upcoming show. “The show oblivion is a personal exploration of recent times in my life which have been extremely traumatic and catastrophic. 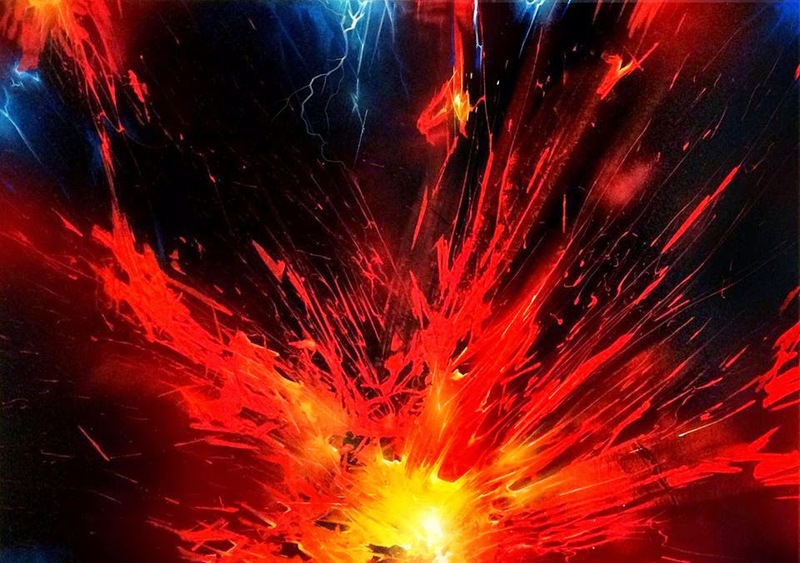 The show title “Oblivion” reflects the apocalyptic nature of the ideas behind the works; thinking the world was ending, being trapped in a personal hell, with pain and torment, standing on the edge of the abyss....Explosive, gestural swathes of fire and colour erupt from the canvases, like hellish volcanoes, with lava, aggressive and energetic, they scratch at the canvas surface like open wounds, glowing with heat and intensity.....The large scale of the paintings adds to the drama and all-encompassing feel I wanted to achieve. Standing in front of them you see nothing in your peripheral vision, just the hellish scene in front of you. You are for a moment, within that maelstrom, as I was. The large scale also allows to become far more involved in the painting physically. There are huge gestural strokes, for which I used the whole body literally to blast the paint onto the surface. It's a truly intense expression of underlying emotions and pain. Exorcising demons." Open daily thereafter until 14th October 2014. 11am-7pm.